The WiFi link used for communications from the Dispatch center to trucks within the complex of a iron ore mine in Brazil was plagued by poor radio coverage, moving objects with intermittent connection drops and a great deal of interference from other nearby WiFi networks. This is a harsh industrial environment for radio communications. The standard communication system used at the mine had coverage holes throughout its limited range of 700 m from the base station to the vehicles. 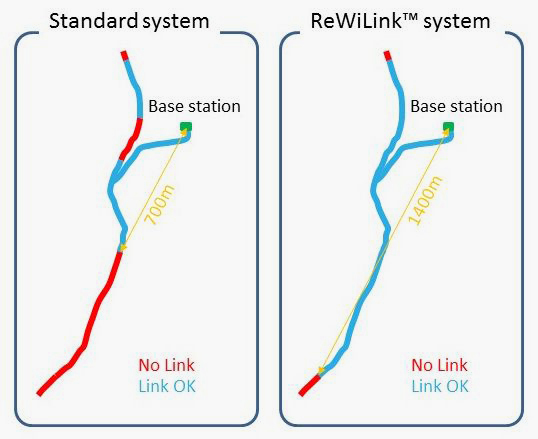 When ReWiLink™ software was added to the same radio hardware and antenna, the range doubled to 1400 m with full coverage along the whole length of the route.